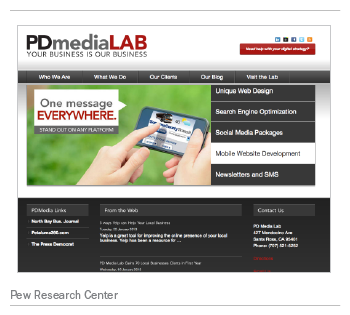 Unveiled in October 2011, the Press Democrat Media Lab is an outgrowth of the “digital agency,” concept. The digital agency is a new revenue model for newspapers that includes not just selling space to advertisers, but also functioning as digital marketing consultants, helping merchants with everything from website building to e-commerce. So far, the industry verdict on the concept is mixed. In Pew Research’s March 2012 report on newspaper economics less than half of the papers reporting data said they had started a digital agency business, and in most cases, it was bringing in modest revenue-less than $10,000 a quarter. The 13 executives individually interviewed for the report were split over whether they thought the digital agency represented a promising revenue stream or an unwise use of coveted resources. Still, while there is no reliable count on how many newspapers have implemented digital agency models, a number of major companies, including Hearst, McClatchy and Gannett, have launched some form of one. 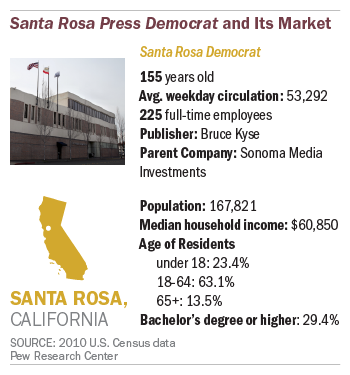 In Santa Rosa, the agency was part of a broader digital revenue push after the paper lost 90% of its classified advertising dollars between 2005 and 2009. And at this paper, there is no such uncertainty about the wisdom of its creation. The lab, built under the leadership of publisher Bruce Kyse, advertises itself as “suave geek” and offers clients a package of options that range from web development to search engine optimization to video production. It is staffed by seven full-time employees, six of whom were hired from outside the paper, as well as a stable of freelance designers. Currently, the lab serves about 65 clients, and according to Press Democrat digital director Greg Retsinas, the average customer signs up for two to three different services, meaning they are paying a minimum of $1,000 a month. When the advertising dollars generated through the Media Lab are added in, the enterprise accounts for about one-quarter of the Press Democrat’s digital revenue and the publisher projects a healthy rate of growth for the next year of about 60%. “Let’s say we are hitting our benchmarks,” says Kyse, who believes the core function of the Lab is to create relationships with clients that will evolve and become more profitable over time. The Press Democrat, which traces its lineage to a four-page weekly that began in 1857, is a mid-sized paper with a circulation of about 53,000 based in Northern California wine country. Sonoma County, where Santa Rosa is located, is “very much a locally oriented shopping experience….Starbucks doesn’t do well here,” says digital director Greg Retsinas. Santa Rosa is a relatively well-to-do community with an average household income of about $61,000. And while he acknowledges that the area’s uniqueness and local shopping environment is a factor in the Media Lab’s success, Retsinas is confident about the fundamental soundness of the model. “We could have done this anywhere,” he says. Deborah asks Nick about a “content plan” for his website and works with him to edit the site, suggesting how to better present customer testimonials. She tells him that on Facebook “people will un-like you if you’re pushing non-relevant material. The key…is shareable content.” She walks him through an array of services the lab can provide from search engine optimization (SEO) to reputation management. At one point, Nick, alluding to the economic turmoil in the newspaper industry in general, nervously asks Deborah, “So circulation’s good? You guys aren’t going out of business?” She reassures him and points out the paper’s reach, citing statistics such as more than 11 million desktop page views a month and the 315,000 North Bay residents who read it every week. Later that day, three staffers are working with a lab client who sells beauty products online. The Media Lab is designed to be one-stop shopping for digital marketing, with three main types of services, each with various levels of services-and price tags. When the Media Lab discovers a negative review of one of its client’s businesses, for example, it contacts the reviewer, apologizes for the experience and offers to set up a one-on-one conversation between the customer and the manager of the business. Along with Retsinas, the Press Democrat staffed the Media Lab with six full-time employees-two web developers, a team manager, a content writer, an SEO specialist and a customer service liaison-all hired from outside the paper and outside the newspaper industry. The time it takes to consummate a sale to a Media Lab client is generally longer-anywhere from two to five months-than it is with advertisers “because of the due diligence each business puts into selecting a web services provider,” Kyse says. One of the key decisions the Press Democrat made about the Media Lab was to target merchants who had large enough businesses to afford a substantial digital marketing campaign. “We said ‘What’s our bottom line here? Can we make money off a business that generates a million dollars in revenue?” says Kyse. “So we sort of identified our sweet spot,” concluding that businesses need to gross at least $1.5 million annually to be a potential customer at the Media Lab. Established as its own business unit, the lab has a separate profit and loss statement and Kyse says it is profitable. The numbers offer some insight into the size of the business. Retsinas says the average client is paying for at least two different tiers of service, which means spending at least $1,000 a month. He also says that many of the customers whose contracts have now come up for renewal are opting for more complex and expensive levels of service. Currently, the revenue from lab services accounts for 14% of the paper’s digital dollars, a figure that rises significantly to about 25% when the additional advertising generated by the lab is counted. Press Democrat officials expect revenue to grow by about 60% in 2013-based largely on the deals with new clients that were in the pipeline in the fourth quarter of 2012-and think that the lab can eventually account for 40% of the overall digital revenue. 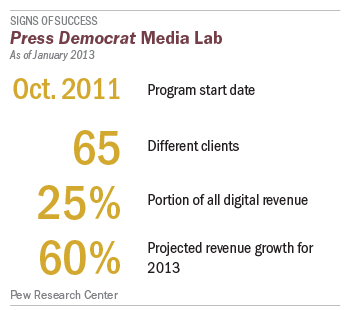 That digital revenue is a growing component of the overall business at the Press Democrat. Kyse says that currently, digital ad revenue accounts for about 28% of the company’s total ad revenue and is growing annually by about 30%. The Press Democrat is not yet charging users for digital content, but a paid digital subscription plan is expected to be in place later this year. Print revenue was down around 5% overall in 2012, Kyse estimates, but he expects it to hold its own in 2013, thanks largely to anticipated new advertising from a number of businesses opening up in the area, including a major casino and two new shopping centers. Retsinas says one major reason for the success of the lab to date is customer service. “We’re very hands on, constantly reviewing data,” he says. “We stick with you.” That was a selling point for Keni Meyer, owner of the Sport Dog Center, a new Santa Rosa business that specializes in dog training. 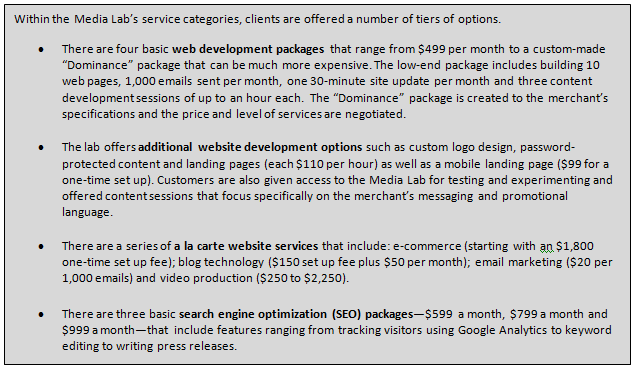 Meyer interviewed a number of vendors about building her web site before choosing the lab. “I went back and forth because they’re generally higher priced,” she says. But “they offer a few things that other people didn’t. I like the fact that they’re there” to regularly consult with the client. Meyer, a reader of the Press Democrat, has a basic package of services for now, but may add on in the future. “I could start basic and go from there if need be,” she adds. Several major steps were taken to initially help finance the lab as part of a broader digital transition at the company. For one thing, the Times Co. agreed to two years of budget relief for the Press Democrat, removing some of the immediate revenue pressure. But as Kyse noted, the paper also made the “difficult decision…to harvest some of the print opportunities faster in order to finance the digital transition.” That included raising some subscription rates-by as much as 45%-and eliminating the award-winning glossy wine magazine Savor. Press Democrat officials say the paper’s reach and reputation in the community is a significant asset in selling the Media Lab. But they also say the biggest concern in setting up the Media Lab was making sure it could function independently from the core business. While Retsinas was an in-house employee, the Press Democrat decided to go outside for Media Lab staff, paying salaries “commensurate with the world of private marketing, public relations and advertising,” which generally exceed those paid in the newspaper world, according to Retsinas. For all the challenges involved in implementing the digital agency concept, including wringing a major budgetary concession from the corporate parent, the prospect of failure did not seem to weigh heavily on Press Democrat officials. “We were always pretty confident going in,” says Kyse. When the Press Democrat was devising the Media Lab concept, it talked to advertisers who were already spending money on web sites, SEO and social media messaging elsewhere in the digital marketplace-often with multiple vendors. What they learned led to some key decisions that were critical to the success, so far, of the Santa Rosa digital agency. Figure out where the agency fits in the market and target the right customer. In the case of Santa Rosa, this meant developing a product aimed at merchants grossing $1.5 million or more and charging them accordingly. “We did away with the bottom of the market, it was a conscious decision,” says Kyse. “We decided we were not going to be a low cost producer,” adds Retsinas. Install customer service as a key component of the digital agency. As new Media Lab client Keni Meyer indicated, the lab’s hands-on approach was a key factor in her signing on. The fact that the Press Democrat has created a physical space, a showroom that is designed for client visits and follow-up consultations, helps enhance that aspect of the digital agency service. Select a content person to run the digital agency. The decision to put a news-side employee, Retsinas, in charge of the lab may seem like an unconventional one. But Kyse says he was the right fit for understanding digital messaging and marketing. Retsinas built the “biggest local website in the county,” the publisher says, referring to pressdemocrat.com, which has between 1.2 million and 1.5 million unique visitors a month. As one example, a local visitor’s bureau that already had a contract with the Media Lab for search engine optimization recently decided it wanted more content on its website. To meet that need, the lab went out and hired stringers to produce that content and now functions as the site editor for the visitor’s bureau. “Can we do more to expand out?” says Kyse. In his mind, that’s a rhetorical question.